This year marks the 60th anniversary of Waiting for Godot’s English publication — Beckett’s self-translation of his original French play, En Attendant Godot, back into his native language. Godot was not Beckett’s first attempt at French composition; he had begun writing poetry in French as early as 1938 and translated Murphy into French in 1939. But Waiting for Godot was Beckett’s major foray into what would become his career-long routine of composing in French and self-translating into English. In the curious underworld of Beckettian translation studies, it’s a vexed topic. Some critics consider the doubled nature of Beckett’s oeuvre its distinguishing quality. Certainly, Beckett’s eccentric writing practice makes his bilingual corpus unique in the history of literature. But how do you classify self-translated texts? They eschew traditional categories, dwelling in some foggy realm between translation, revision, and authorial re-interpretation. Then there’s the matter of priority: which text — French or English — emerges as the authoritative version? The English “translations,” written in Beckett’s native tongue, throw into question the “originality” of the original French texts. After all, don’t the French originals already imply the work of translation? Most scholars agree that the two versions of Godot should be studied side-by-side. In this way, any notion of priority is annulled, and the possibility of locating an “original” text, so central to our conceptions of artistic production, is all but swallowed by this black hole of textual duality. It is becoming more and more difficult, even senseless, for me to write an official English. And more and more my own language appears to me like a veil that must be torn apart in order to get at the things (or the Nothing-ness) behind it. Grammar and Style. To me they seem to have become as irrelevant as a Victorian bathing suit or the imperturbability of a true gentleman. A mask…Is there any reason why that terrible materiality of the word surface should not be capable of being dissolved? This rejection of style figures, in a letter dated later that same year, as a sort of violence against language: “From time to time I have the consolation, as now [Beckett is writing in German], of sinning willy-nilly against a foreign language, as I should love to do with full knowledge and intent against my own — and as I shall do — Deo juvante.” What’s remarkable in these passages is the sense of desperation — indeed, of fervent compulsion — that drove Beckett to abandon his mother tongue. That English seemed to him “senseless” and “irrelevant,” a sort of falsity or façade that he felt compelled to “tear apart” and, finally, to “sin against,” throws Beckett’s bilingualism into a considerably darkened sphere. He wasn’t just playing around with language when he switched to French; the change marks neither an indulgence in the sport of interlingual word play, nor the disciplined resolve of a man fashioning himself a sort of writing exercise. Rather, the move from English to French was motivated by a fundamental necessity. It is as if Beckett required French for his very survival as a writer. Given the caliber of his early (English) work, it does not seem unreasonable, after all, to suggest that his status as literary genius is closely linked to his adoption of the French language. Still, this seems a somewhat simple assessment. Joyce’s elaborate use of language stands in opposition to the minimalism Beckett sought, but Joycean prose can hardly be considered the language of traditional, highly-stylized English. In fact, disparate as their styles seem, Beckett and Joyce might be said to unite, in a manner, on the level of their reworking of the English language. If Beckett reached English through French, Joyce introduced the mother tongue to French, German, Italian, Latin, and other languages besides. In short, if Beckett’s reworking of English contrives to escape Joyce, it is an escape that simultaneously mimics him, for Joyce had already endeavored a great escape of sorts. The genteel “gentleman’s” English that Beckett despised was more closely embodied by someone like Samuel Johnson, a literary figure of special interest to Beckett. He made a pilgrimage to Dr. Johnson’s birthplace, scrupulously perused the pages of Boswell’s Life of Samuel Johnson, and filled his journals with notes on Johnson from which to compose a play. Though Beckett was fascinated by the man, he probably received his work somewhat differently: Johnson’s Dictionary of the English Language and reputation as the authority on English letters easily rendered his name synonymous with the brand of English Beckett struggled to shake off. Of course, if English in Beckett’s mind was the language of Johnson, it was also the language, however refashioned, of Joyce. Sitting down to write in English, Beckett inevitably composed a Joycean English. Beckett’s relation to his literary forefathers and to the English language — his near-violent desperation to do away with English and simultaneous adoration for Joyce’s work — is a case study in the complexities of literary influence. Harold Bloom (in The Anxiety of Influence) famously tried to de-idealize our notion of how one writer forms another — to refute the idea of literary creation as a carefree experience of muse-dappled inspiration and present it instead as an arduous, anxious, even diseased process: “Influence is influenza — an astral disease. If influence were health, who could write a poem? Health is stasis.” At once enraptured by his forefather’s work and nauseated by its effect on his own stunted writing, Beckett fled into a foreign tongue. His is an unusual and extreme instance of poetic anxiety. Beckett didn’t just try to “get outside” his literary forefathers, which is how Bloom thinks most great writers produce original work. He tried to get outside even the language in which they wrote. In his adoption of French, Beckett may have recalled Joyce but he also rejected him. It wasn’t possible for him to innovate within the confines of the English tradition. He needed to rid himself of the language entirely — its echoes and associations — in order to open himself up to the potential for original artistic production. Beckett’s French texts — and, by extension, their English translations — are the result of this radical attempt to “get outside,” the anxiety of a writer infected not merely at the level of his forefather’s work, but at the level of the very language he employs. Writing in French, Beckett adopted a new literary personality — a French life, a French set of texts, a French identity and reputation. It was his attempt to make a fresh start. But there is no clean slate on which to write, no mind wiped blank of history and influence — only the accumulation of voices, the last of which was his own. In En Attendant Godot and his other French texts, Beckett “sinned” (as he longed to do) against English and his literary forefathers. In Waiting for Godot and his English texts, he brought the sin home, facing down English — the language, the canon, Joyce, everything that had exiled him from his native tongue. Working through French, Beckett succeeded, finally, in writing himself into the English literary tradition. He isn’t, in the end, strictly a writer or strictly a translator in any single work. Instead, Beckett’s texts collapse those identities, suggesting that authorship is always a matter of translation — the translation of experience into thought and thought into writing. His point in persistently translating his own work seems to have been to confuse us, to complicate the distinction between original and translation so that we are compelled to understand language generally as a kind of translation — and original texts as the consequence of texts that have come before: a vast lineage of influence and interpretation. Beckett just added a further leg to the journey, creating along the way twinned masterpieces in French and English. Elizabeth Winkler is a writer based in Washington, DC. She has contributed articles to The Economist, The New Republic, Foreign Policy, and the Los Angeles Review of Books. Read her work at journalistwinkler.com or follow her @Zwinkler89. On this sad anniversary, USA Today trots out the now tired question, asking for, as if we’re all looking for it, the mythical novel that will explain and place into context the tragedy of six years ago. In this case, USA Today points out the uninspiring sales of “novels inspired by 9/11” as compared to their non-fiction counterparts, but the subtext of these articles, and there have been many in many venues over the years, is twofold.First is that the serious novel’s driving function is to make sense of our complicated world, to distill it to its essence so that years from now, when a young man asks how 9/11 felt, an old man can wordlessly slip a book into his hand. Second is this idea that every major event requires the culture to produce innumerable artifacts that are explicitly about that event. There are hundreds of films and TV shows that are primarily about 9/11, but where, the culture watchers ask, are all the novels?I wrote about this several months ago, when the publication of Don Delillo’s Falling Man led several to seek the “9/11 novel” (Falling Man deemed to have failed in this respect), and I still believe what I wrote then.I would argue that nearly every serious novel written since 9/11 is a “9/11 novel.” Writers, artists, and filmmakers, consciously or subconsciously, react to the world around them some way, and 9/11, from many angles, is incontrovertibly a part of our world. For example, even Michael Chabon’s The Yiddish Policemen’s Union, which is set in an alternate universe in which a temporary Jewish homeland has been set up in Alaska, is a “9/11 novel” in that it has internalized the post-9/11 sensibilities of shadowy government meddling in the Middle East and the feeling of an impending global and religiously motivated conflict. To expect a novel to explicitly place 9/11 into a context that offers us all some greater understanding of it is to misunderstand how fiction works.There may never be a so-called “defining 9/11 novel,” but there are already many 9/11 novels, some more explicitly about 9/11 than others but all internalizing that event to one degree or another. Still, since it seems likely that we will not satisfactorily settle on the one anointed 9/11 novel, writers will have a topic to dust off every year when this anniversary rolls around. I agree that it’s much too simple to say Beckett fled his mother tongue to escape the creativity-crimping shadow of his literary hero and friend. As you deftly point out, Joyce himself, throughout his evolution, was no practitioner of clean, English gentleman’s prose, whether we’re talking about the brutal bareness of his style in Dubliners, or the total threat he poses to conventional grammar and syntax in the later novels. What your comment on Beckett’s point that “authorship is always a matter of translation” made me think about was his trilogy, in which we’re introduced to a cascade of overlapping personalities—some of them seemingly quite similar—competing with each other in a fruitless quest to find identity and clarify their predicament. Though the quest is futile, the “M” characters never quite get disillusioned enough to stop striving. Part of their striving often involves expressing, or translating, their thoughts to a page. It’s also no accident that many of the ‘M’ characters of the trilogy are writers and avid (if highly unorthodox) storytellers. Their need to translate cognition, to make translators of themselves, becomes a compulsion. And in some of the most shockingly virtuosic passages Beckett basically incorporates himself—Samuel Beckett, novelist and playwright—into this chain of fabulists. In doing so, he not only creates what I believe to be the best work of meta-fiction to date, but also a literary effect in which the characters seem, at once, like a composite of many people and a concentration of just one. Beckett is the master of getting plurality and isolation to coexist. The author might want to note that Beckett’s letter to Kaun was written in German. What is always quoted in English is itself a translation. 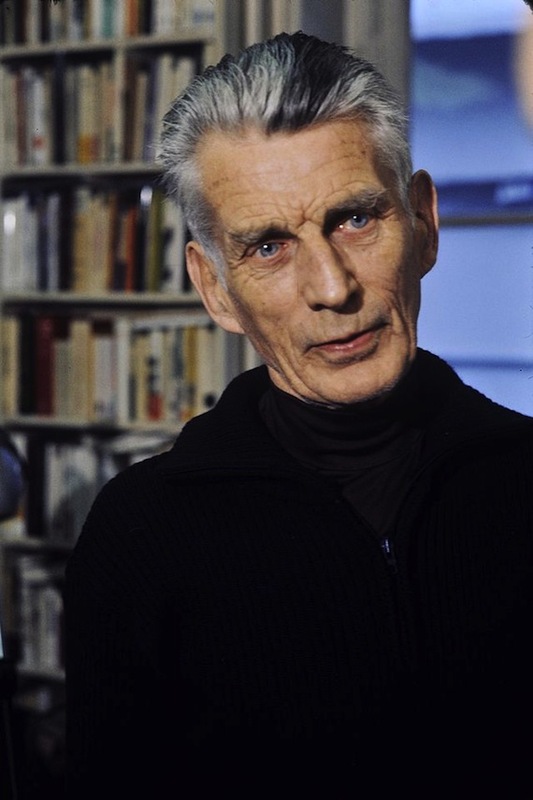 Beckett’s bilingual corpus is not “unique in the history of literature.” Other authors who have translated work they have written in an adopted language back into their native one include Andre Brink, Isak Dinesen, Ariel Dorfman, Julien Green, Nancy Huston, Mendele Mokher Sforim, Vladimir Nabokov, and Ngũgĩ wa Thiong’o. Good article, but I have to disagree with the conclusion. I rather think that “his point in persistently translating his own work” was to (i) offer it in another language and (ii) pre-empt less felicitous translations by people less familiar with the work. I don’t think you can draw much conclusion from the sheer fact of Beckett translating himself. The interesting issue is why he chose to compose his major work in French, and I think this piece gets close, but it was simply that ones native language contains a multitude of associations and complexities, and Beckett wanted to be rid of those. French for him was a clearer medium than English, a pane of glass rather than a prism. The author neglects the intricacies of the bilingual brain and the deep-seated effects of language acquisition on a person’s personality. Every language is a filter between thought and reality. When bilingual (or multilingual) the direct experience of life is mediated by and through each language. The subjective experience is doubly so when achieved through different filters and its expression bears the hallmarks of that as well. Take ‘cheese’ for example (bear with me). If Beckett, were to use the word it would conjure up certain images and associations – perhaps the bland cheddar of Beckett’s Dublin youth, while the French equivalent ‘fromage’ might immediately remind him of Brie (Beckett lived many years in the part of France where Brie cheese is produced). The two words while directly translatable from one language to another don’t represent the same concepts. On an apparent level they seem like equivalents or homonyms, but in the writer’s subjective experience of reality they are not and have different emotional resonances. The point I’m trying to convey is that if he writes in French he has access to a certain set of images that would not necessarily be those that would initially occur to him if writing in English. Translating from French to English is not just translating from one language to another, but translating from one experience of life to another. French was the language of Beckett’s adult life, not that of his childhood. This makes a difference. He would only really have approached and experienced life through the filter of French as an adult and as such was freed from words’ associations in childhood. English would always been more deeply charged and blurred by the fact that it was also the language of his childhood. His French self is automatically more mature, has always seen and experienced and expressed life as an adult. It is arguably less rooted too as a result. Ultimately I think part of what Beckett was trying to do by writing in French was to access a parts of his personality that were less biased, (or that at least only held the biases of adulthood) and translating from French gave him something ‘purer’ or ways of expressing himself that wouldn’t have necessarily immediately occurred to him when writing directly in English. It’s important to take into account the trauma of the war that Sam had experienced, with death just around the corner. “A country road, a tree,” the stage directions that open Godot, point to the landscape of that period. I think he needed to write in French to write about the desolation he experienced during the war, which became his palette for the rest of hic career.